I talked recently about spouses and the woodshop. I concluded that there’s a lot of give and take, but in the end having a spouse around is ultimately a plus. I just got another example of why two days ago. The electricians were here this week, and one evening after they’d left I showed Sally everything they were doing. Although I’m framing large portions of the shop, one long concrete wall where most of my machines will go isn’t getting any kind of wall treatment for now. Because this is also the wall were most of the waste pipes run, framing it in to hide all that is just too involved (and expensive) just now. I’ll definitely do it later, but right now other portions of the shop are more important. I hadn’t thought of that, not once, and so of course had not mentioned it to the electrician. When he came to finish the wiring the next day, I explained about the future wall. 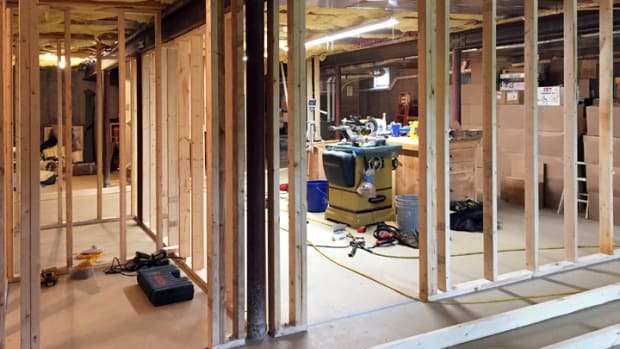 No problem: The wiring hadn’t been cut to those drops yet, so he said he’d loop an extra couple feet up in the joists to each drop to make extending them to a new wall easy. But the thing of it is, is that I never thought of this. When the day came that I finally built that wall I would have been kicking myself for the lack of forethought. But fortunately, I had my non-woodworker wife around to point out what should have been obvious to me. As far as I’m concerned, she’s permanently earned her place in my new shop.